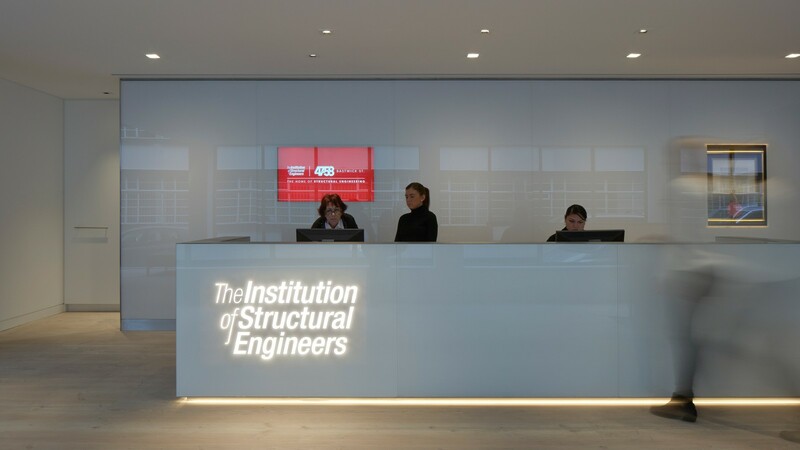 The new headquarters of the Institution of Structural Engineers are located in Clerkenwell, a central London district with a high concentration of architects and engineers. 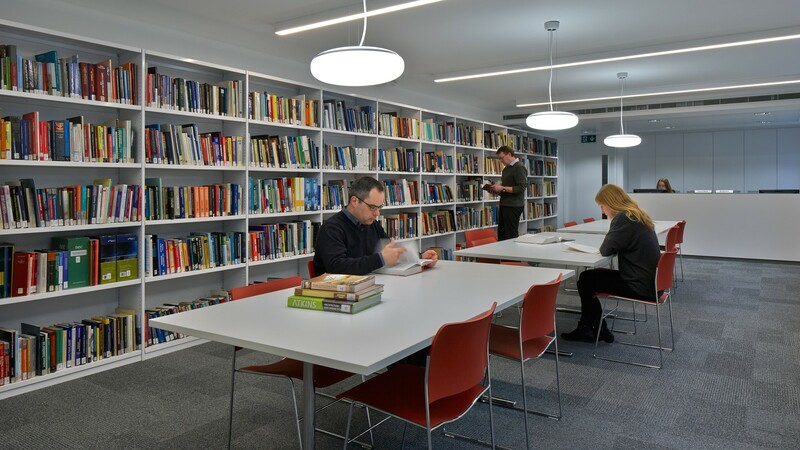 The revitalised building enhances the Institution’s role within the professional community, providing a public conference centre, members’ facilities and library, as well as flexible workspaces for the Institution’s 55 permanent staff. Hugh Broughton Architects were appointed to design the project following a competitive interview. 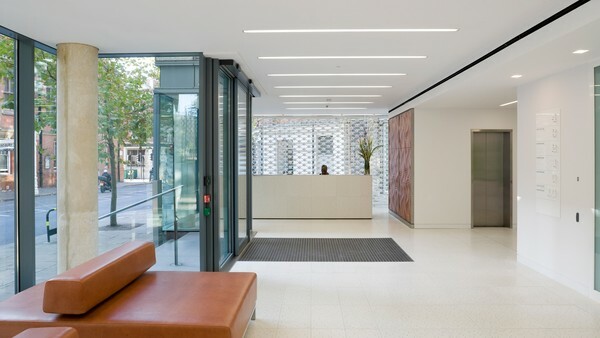 The brief was to transform an inconspicuous four-storey 1960s office building into a modern and confident 21st century home for the Institution, whilst also demonstrating the value of collaboration between architect, engineer and client. 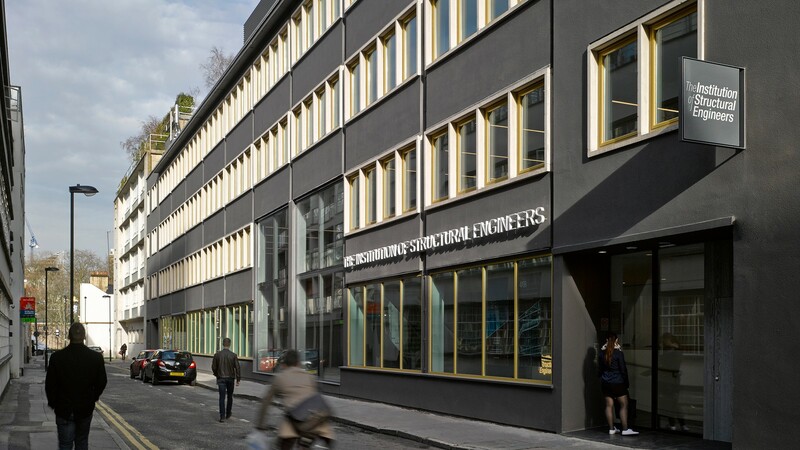 The brief also required us to demonstrate the application of sustainability in retrofit and reflect the values that have underpinned the Institution since its foundation in 1908. 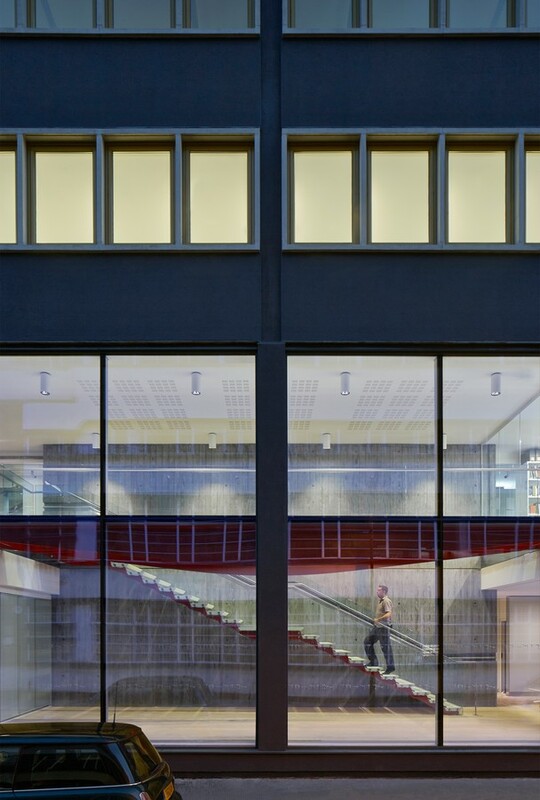 The north elevation, which was characterised by a rigorous pattern of windows, has been opened up with a dramatic double-height glass-fronted foyer at street level, which floods the entrance with light. 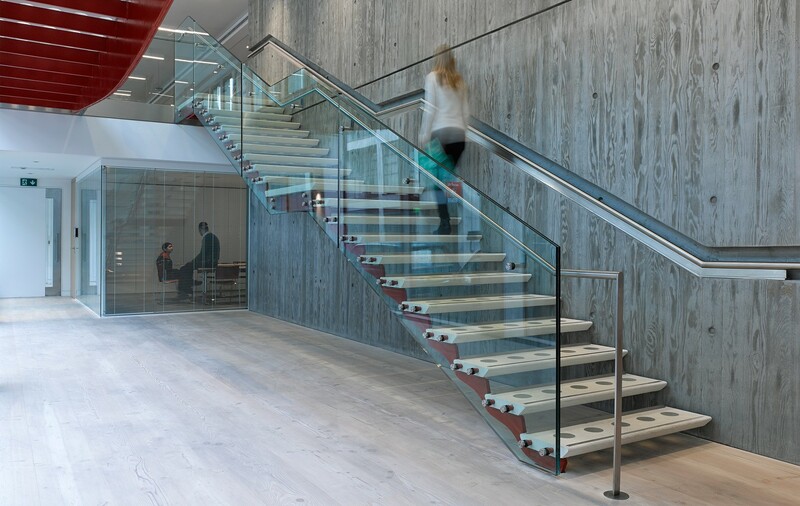 The entrance reception and foyer exhibition space showcases the four principal building materials for creating structure: timber, glass, steel and concrete. 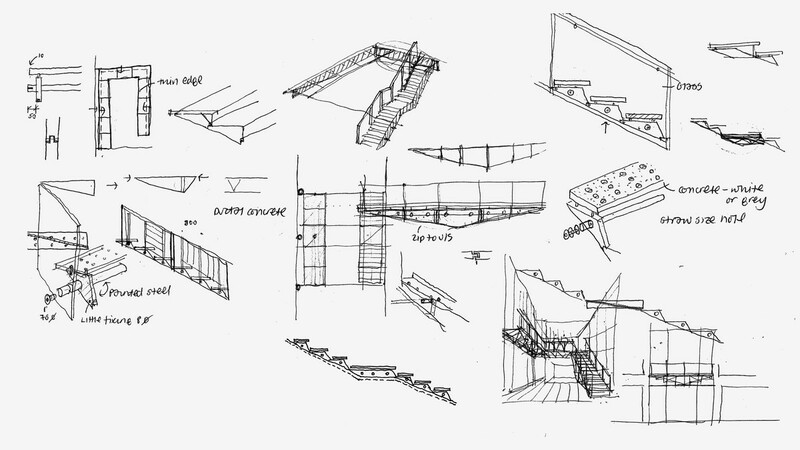 A finely detailed, horizontal-cantilevered staircase in pre-cast concrete and steel, designed with Expedition Engineering, is a contemporary reinterpretation of the traditional cantilevered stone stair that characterised the Institution’s former building on Upper Belgrave Street. 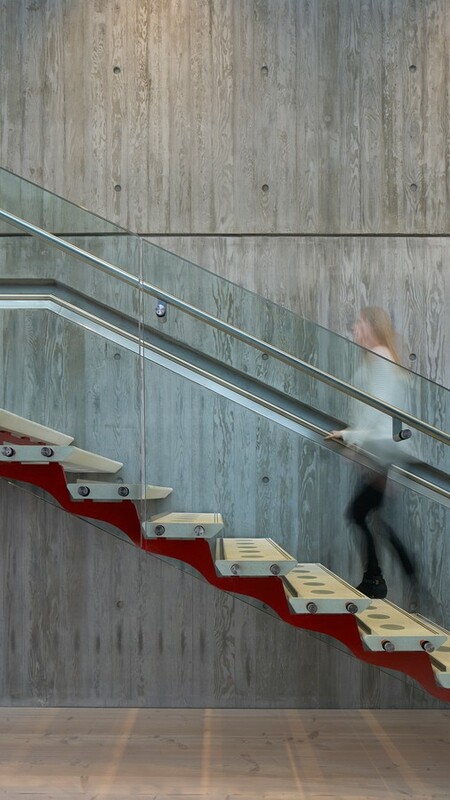 The stair is supported on one side by an exposed in situ concrete wall, with the textural grain of the Douglas fir shuttering imprinted into its surface. 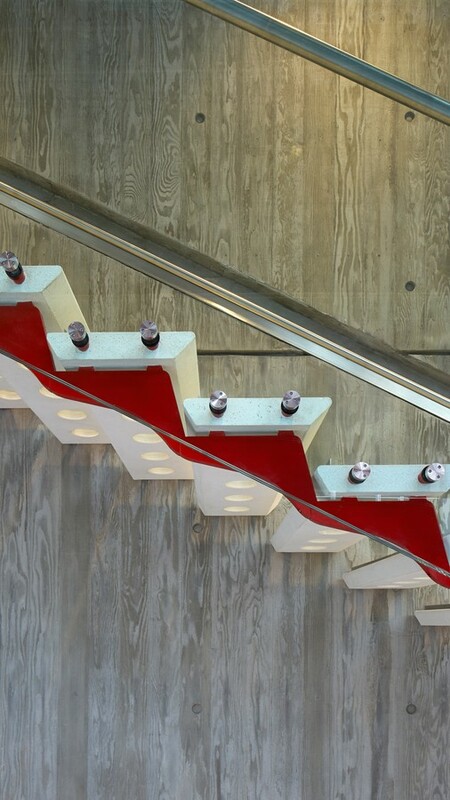 The treads are supported by a gracefully shaped minimalist red steel stringer and formed in white pre-cast concrete punched with cast glass lenses, which diffuse light through the stair. The treatment continues in the atrium bridge opposite, where the shape of the bridge reflects the structural bending moment. 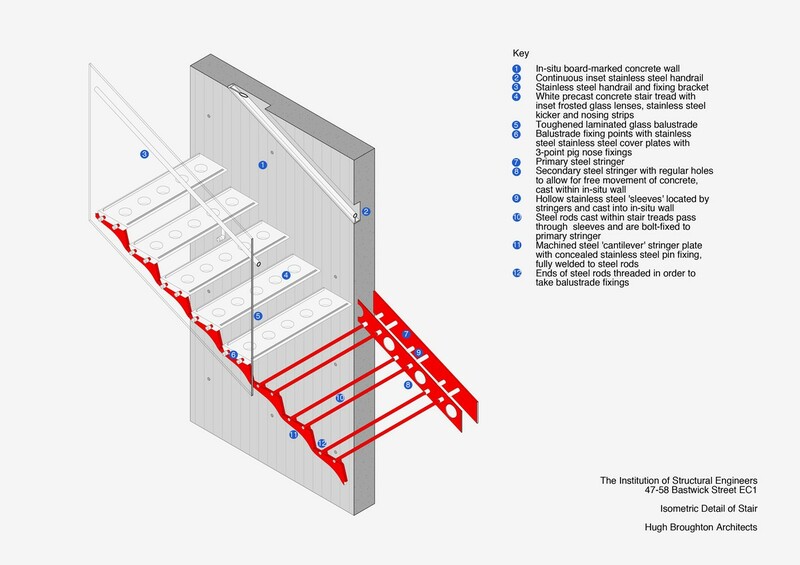 Set behind the new glazed double-height façade and illuminated at night, the stair is clearly visible from the street, and will become a motif for the pioneering design that the Institution supports. 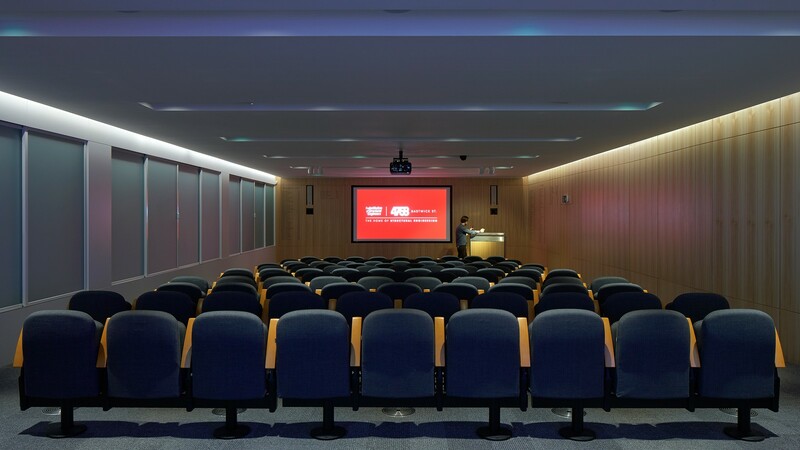 The ground level is accessible to all and includes a 104-seat auditorium and meeting rooms, with state of the art audiovisual, videoconference and web casting facilities. 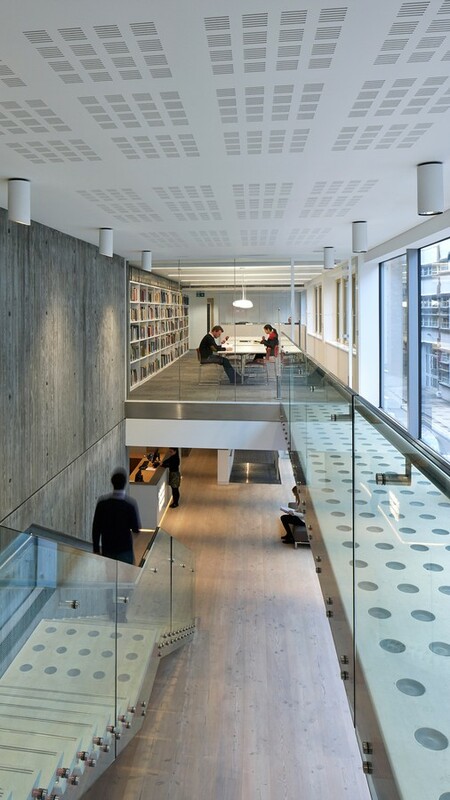 Moving up the building the spaces become increasingly private, with the members' facilities including a library and business centre flanking the double-height atrium on the first floor. The upper levels are reserved for staff offices, which include open plan workspaces, cellular offices and meeting rooms fitted with videoconference facilities. The entire project was designed with sustainability as a design focus, reflecting the ambitions of the members. Reusing an existing building and minimising the requirement for new structure significantly limited resource use and the associated embodied energy. The design incorporated passive sustainable measures including thermal improvements to the walls and roof to achieve high levels of insulation, reduced air permeability and minimal energy use. New materials have been responsibly sourced from suppliers with environmental accreditation, and the Douglas fir timber shuttering used in the construction of the concrete wall has been reused to make the timber entrance doors and to clad a new extension within the rear courtyard. 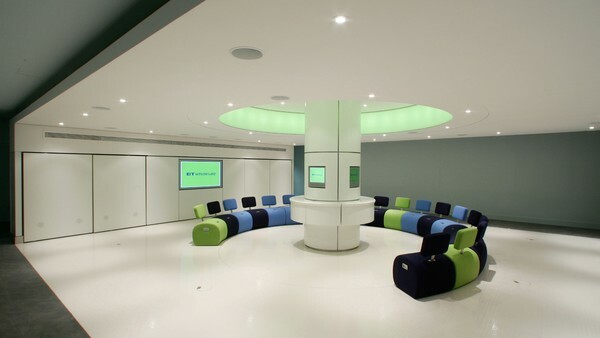 Aside from the building refurbishment, the new headquarters also promote a culture of reducing members’ carbon footprint. By vastly improving connectivity and on-line access, the new video conferencing and webinar facilities offer a leap forward in the way members engage, and significantly reduce the requirement for international travel.